Hello! 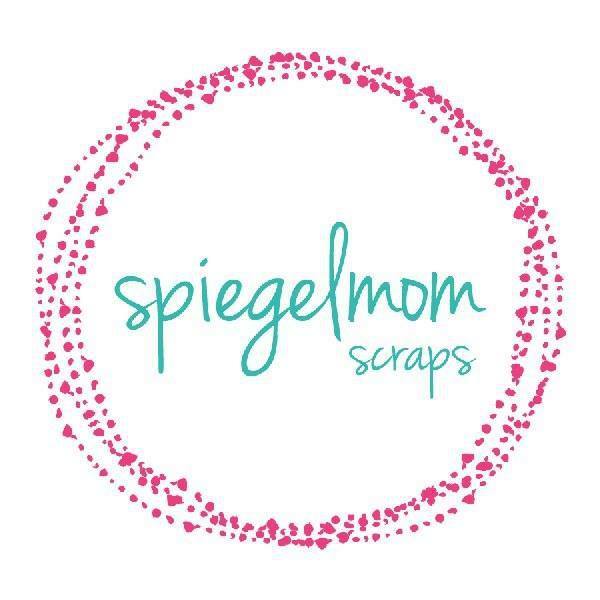 I’m glad you’re joining the SpiegelMom Scraps SCRAP IT OFF Anniversary & Design Team reveal blog hop! You should have arrived here from Laura Rumble’s gorgeous blog. During this event three new sequin mixes, a free exclusive cut file, and the new design team (including me!) will be revealed + prizes, yay! If you happen to be joining the blog hop right here, be sure you check out the rest of the designers. Oh and the fabulous products in the SpiegelMom Scraps shop – some of which are pictured below! That bold Basic Grey background paper inspired me to use circles throughout. I made a quick template from a circle punch to create a stencil to use with Shimmerz Dazzlers in Spun Sugar. Next, I handstitched on some white cardstock to lessen the effect of the graphic background. I punched out a spot for a shaker pocket (swoon) where I used the exclusive Peachy Sherbert sequin mix. You can see it in the product photo above in the top left corner. I used some washi tape and a painted on strip of Shimmerz Dazzlers I Lilac You where the papers meet. I backed my photos with circle cut paper (side note: layering circular pictures is HARD) and started adding embellishments. I loved the challenge of embellishing multiple pictures without making the layout too busy. This cloud feltie was perfect for my “hike” picture. I used some stamping, sprinkled that same sequin mix across my page, added a few things from the Crate Paper Hello Love collection, and a few wood veneer pieces. That adorably tiny clothespin holding my silhouette-cameo-cut title is also found in the SpiegelMom Scraps shop. All products found there are linked. Thank you for spending your time with us today! I’d love for you be entered to win some of the prizes that Jody is giving away on this blog hop, so be sure to leave comments on every blog to be entered! You have through July 31st to comment and enter. Sharing on social media will also earn you an extra entry 😉 Just leave another comment letting us know where you shared the blog hop event. It’s that easy! Welcome to the team Rachel!!!! I love all the elements in your layout and getting to know you a little better! I’m very excited for this DT!! Thank you so much Jody! I’m so excited! Great idea for an “introductory” layout! So sweet! Can’t wait to work with you in the coming months! Thank you, Sara. Can’t wait!! Rachel, I love your little shaker spot, that’s so cute!! and the washi/dazzler combo is a great idea. Your layout is so pretty! Love how you created that gorgeous background paper! Stunning layout! What a gorgeous design with all the fun circles! Love all your details. Such a pretty layout, love the shaker element!! Thank you! Shaker elements are always so fun! What a really fun Layout Rachel!! Congrats on making the team!! I really love this layout. I love all the circle elements!! CAn’t wait to see all you create!! Thank you, I so appreciate your kind words! Congratulations on joining the team. Your layout is fun and creative! So fun and playful, now I want to make a layout about some of my favourites, Thanks for the inspiration! LOVE (💜💜💜) that background paper. So neat to scrap about some of your favorite things. Congrats on being chosen as a designer! The background paper is so fun! Thanks so much! Love how you documented your favorite things and the colours are lovely. They are the BEST aren’t they?! I’m a proud dog mom. Thanks so much! Nice layout, congrats to making the design team. Love your use of a bold background paper and how you shaped your photos to match. Great layout. I love all the circles and flair! so pretty! I love layouts that tell about ‘us’ and this reminds me I need to do that more! Love the way you pulled this all together. Yes I totally agree! Thank you so much! Literally (ok maybe not LITERALLY) drooling over that sequin eye candy! Haha! Gorgeous layout!! Literally is okay too 😉 thanks girl!! Such a fun layout!! I really love all the circles and how you used the dazzlers!! I’m so excited to be working with you on the team! Thank you Megan! I can’t wait!! Awesome layout, Rachel!! The color is awesome, too!! Great layout, Rachel….love all the color! !